For the coach, see Don Lee (American football). 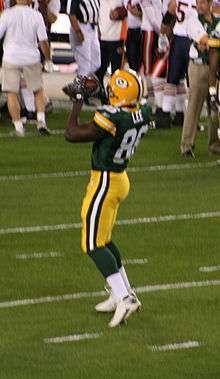 Donald Tywon Lee (born August 31, 1980) is a former American football tight end in the National Football League (NFL). He played college football for the Mississippi State Bulldogs. He was drafted by the Miami Dolphins in the fifth round of the 2003 NFL Draft and spent two seasons with the team. He also played for the Green Bay Packers from 2005 to 2010 and the Cincinnati Bengals from 2011 to 2012. ↑ Fly, Colin. "Packers TE Donald Lee gets contract, has career day". Retrieved 2007-11-19. ↑ Pete Dougherty, Rob Demovsky,. "Short week is long enough for Favre and Co.". Retrieved 2007-11-19. ↑ Silverstein, Tom. "Packers' Hawk released, but will re-sign". Milwaukee Journal Sentinel. ↑ Wulf, Bo. "Eagles Shock NFL, Agree With CB Asomugha". Philadelphiaeagles.com.